DSA815-TG is a Spectrum Analyzer up to 1,5GHz with tracking generator, compact design and easy-to-use interface. The DSA815 includes a wide range of standard functions including AM/FM demodulation and a preamplifier. In addition, Rigol offers great options including an EMI filter and quasi-peak detector kit. Rigol DSA815 - Spectrum Analyzer with compact size and light weight. The digital IF technology guarantees its reliability and performance to meet the most demanding RF applications. Rigol DSA832-TG - 3.2 GHz Spectrum Analyzer with Tracking Generator. The digital IF technology guarantees its reliability and performance to meet the most demanding RF applications. 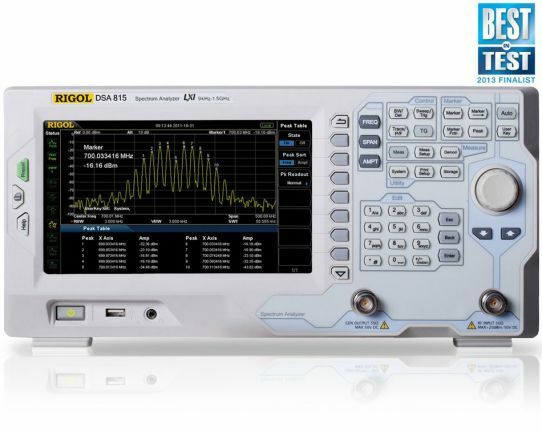 Rigol DSA875-TG - 7.5 GHz Spectrum Analyzer with Tracking Generator. The digital IF technology guarantees its reliability and performance to meet the most demanding RF applications. DSA832E-TG - Small, light and cost-effective 3.2 GHz spectrum analyzer with tracking generator, designed for starters. Configured with easy-to-operate numeric keyboard, high-resolution color LCD display and various remote communication interfaces, it can be widely used in various fields, such as education, company research and development as well as industrial manufacture.